“An indoor farmer doesn’t pray for rain”. Several studies confirm that, by the year 2050, nearly 80% of the Earth’s population will reside in urban centers (today’s rate is up to 60%). Applying the most conservative estimates to current demographic trends, the human population will increase by about 3 billion people during that period, posing new challenges to sustainability and development. An estimated 109 hectares of new land (about 20% more land than is represented by Brazil) will be needed to grow enough food to feed them, if traditional farming practices continue as they are practiced today. At present, throughout the world, over 80% of the land that is suitable for raising crops is in use (sources: FAO and NASA). Historically, some 15% of that has been laid waste by poor management practices. Furthermore, the additional land available for cultivation is unevenly distributed, and much of it is suitable for growing only a few crops. So, why not create more agricultural land by building upwards? Nowdays, we can find vacant spaces and derelict buildings in the city that are suitable for alternative uses, and the trend, for diverse reasons, is to be growing. So, why not use them also for vertical farming? Aside from pursuing eco-friendly policies and smart city models, is key to mega-cities that planning instruments and future city developments must preview also the hybrid use of private and public spaces, also regarding the deployment of farming facilities, at rooftops or specific storeys inside buildings, stated that, horizontal farming in that unique spaces should be expensive. The topic is not new. Several thinkers and experts focused on vertical farming some years ago, but now, after rivers of theory and word spreading debates, VF 2.0 is back to the city and some of the pioneer initiatives about agricultural practices on vertical farms are to be producing astonishing results. 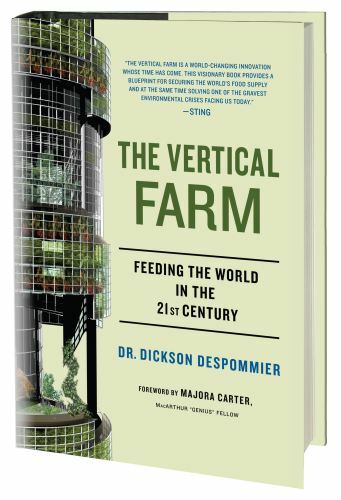 Dickson Despommier, Professor at Columbia University, developed the first concept of vertical farming in 1999. This quickly went from rooftop gardens to complete flats with cultivation floors, trying to offer an alternative to massive land occupation for farming, and shocking the standard believe in farming practices. All his knowing is condensed in his Manifesto “The Vertical Farm. Feeding the world in the 21st Century”, proposing a new paradigm in which urban agriculture, located at skyscrapers can go vertical as well as horizontal, with an specific goal: Cities of the future must generate their own food supply, reducing the ecologic footprint of actual farming and improving our relationship with the environment and, furthermore, the culture of the city and citizens. (and- that is our opinion-, the proximity between farming facilities and consumers, and the extension of basic knowledge about farming and harvesting will help to promote deep changes in the citizenship behaviour, some of them in cultural aspects too). The idea is simple as original: skyscrapers filled with floor upon floor of orchards and fields, producing crops all year round, will sprout in cities across the world. As well as creating more farmable land out of thin air, this would slash the transport costs and carbon-dioxide emissions associated with moving food over long distances. It would also reduce the spoilage that inevitably occurs along the way, and the use of pesticides, herbicides and fungicides can be kept to a bare minimum by growing plants indoors in a controlled environment. Soil erosion will not be a problem because the food will be grown hydroponically (in a solution of minerals dissolved in water). Clever recycling techniques will ensure that only a fraction of the amount of water and nutrients will be needed compared with conventional farming, and there will no problem with agricultural run-off. 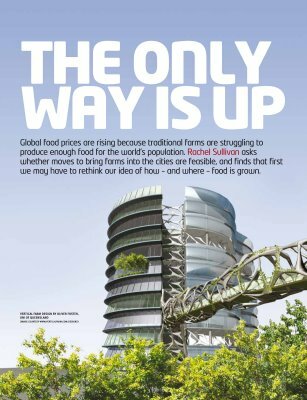 From the mythical designs of the Hanging Gardens of Babylon, a wide variety of projects for vertical farms have been created by architectural firms, and now, some of them are becoming real projects erected around the world. Besides from the radical vision of growing crops in buildings, the technology for vertical farming already exists. The glasshouse industry has more than a century’s experience of growing crops indoors in large quantities. It is now possible to tailor the temperature, humidity, lighting, airflow and nutrient conditions to get the best productivity out of plants year round, anywhere in the world. Furthermore, the technology of hydroponics allows almost any kind of plant to be grown in nutrient-rich water, from root crops like radishes and potatoes to fruit such as melons and even cereals like maize, using hydroponics and suspending plants in a medium—such as gravel, wool or a form of perlite (volcanic glass)—while the roots are immersed in a solution of nutrient-rich water. A constant flow of air keeps the plants bathed in carbon dioxide. Any nutrients and water that are not taken up by the roots can be recycled, rather than being lost into the soil. In many parts of the world, but especially in the province of Almeria, Spain, hydroponic growing methods have changed the way farmers operate. And in the process, as the local expert Antonio Pérez explains, Almeria has been transformed from one of the poorest provinces of Spain into one of the ten most affluent, becoming a grateful place to work and live. Perlite hydroponic systems seem to be helping them do this overcoming the use of sands and other more water comsumptive systems. 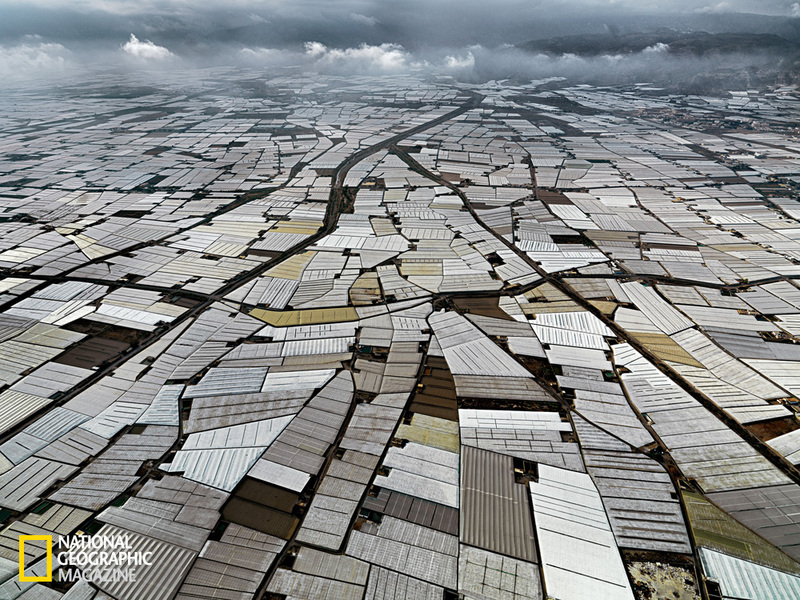 In Almeria, a beautiful semi-arid (not urban space, however) area along the Spanish Mediterranean, greenhouses currently cover over 30,000 hectares (more than 74,000 acres) of land from the sea to the mountains. Over 2,700,000 metric tons of produce are being grown in the region including lettuce, cucumbers, watermelons, beans, squash, cucumbers, peppers, and tomatoes. What makes these numbers particularly interesting is that almost 8 % of all vegetable greenhouses in Spain are now using hydroponic methods, and approximately 54% of Spain’s entire hydroponic industry is in Almeria. In a recent private visit (march 2012) to the Agricultural Experimental Station of Las Palmerillas–El Ejido (Almería) (runned by Cajamar Bank), Juan Carlos Gázquez Garrido and Mari Cruz Escudero gave us a full explanation about the benefits of fostering investigation and transfering knowledge from the Labs to the greenhouses of Almeria region, and the key role of R+D for producers in meeting major challenges associated with globalization and open markets. That examples prove that the system works in extended ground areas, but the goal is about growing crops of vegetables and fruits in flats at the city. Are we up to the challenge? Some of the problems associated with Vertical Farming such as the incidence of light (that cannot be properly regulated) the escaping of a lot of costly moisture and CO2 when windows are opened and destruction of carefully created climate due to sudden bright sunlight can destroy a carefully created climate all at once are to be overcomed by the using of new LED lighting, that improves the benefits of vertical farming in flats. With LED lighting vertical farmers only provide wavelengths which are useful for growth and development of the crop. Contrary to the sun, traditional assimilation lighting and TL lighting, LED only omits one colour of light. No energy is wasted with light spectra that are not used or less used by the plant. This means that vertical farmers can provide exactly the colours which the plant needs for photosynthesis. Plants mainly need blue and red light for photosynthesis and far-red, a colour not even visible to the human eye but visible to the plant. The relationships between the light colours determine the form of the plant. The costs-of-ownership of LED lamps are decreasing steadily. Today, several vertical farms have been erected between 2010 and the present. The first examples are mostly prototypes and are located in Japan, Korea, Holland, USA and England. Japan efforts are concentrated at the vertical farm in Kyoto, called Nuvege (www.Nuvege.com) . This vertical farming is housed in a 4 story ‘quanset’ hut-like building, the rough size of a 747 hangar (2851 square meters) 30,000 horizontal square feet, and utilizes over 57,000 of vertical square feet of growth environment within the same space. The company intent (big enough) is that their innovative Vertical Farming Techniques will provide a universal working model for safe and economical growth environments for the rest of the world. Nuvege’s current corporate goals include efforts to establish branch operations throughout Asia and in urban centers throughout theUnited States. 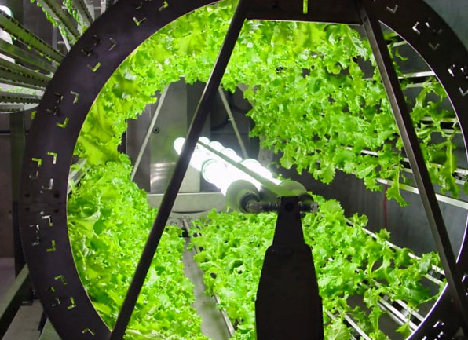 South Korea’s project (Seoul), located in building that is three stories tall and is designed to test various aspects of farming in a controlled environment on multiple floors. Lighting and automation are high on their list of things to work on. They are currently growing mainly leafy green vegetables using high tech LED lighting, and they want to begin indoor aquaculture, as well. Next to the Vertical Farm is a much larger, newly built seed bank building (Agrobiodiversity) that stores all varieties of crop seeds and native Korean plants. Seed viability testing will be facilitated by the vertical farm. Another idea, developed by Valcent, a vertical-farming firm based in Texas, Vancouver and Cornwall, is to use vertically stacked hydroponic trays that move on rails, to ensure that all plants get an even amount of sunlight. The company already has a 100-square-metre working prototype at Paignton Zoo in Devon (UK), producing rapid-cycle leaf vegetable crops, such as lettuce, for the zoo’s animals. The VerticCrop system ensures an even distribution of light and air flow. Using energy equivalent to running a desktop computer for ten hours a day it can produce 500,000 lettuces a year, he says. Growing the same crop in fields would require seven times more energy and up to 20 times more land and water. PlantLab is located in Den Bosch, The Netherlands. It is currently under construction and is based on a smaller prototype that has been up and running for several years. Everything is grown by LED lighting, and they claim that their experiments, using a wide variety of LED fixtures, give a 3X increase in plant yield using precisely controlled frequencies of light in the visible red and blue spectrum. All growing will be indoors with no natural light sources. In addition, they are putting it three stories underground, making PlantLab the world’s first and perhaps only “up-side-down” vertical farm. You can find more details below. A demonstration vertical farm of five stories is under construction in Manchester, England. It takes advantage of an abandoned warehouse and the designers plan to raise poultry in addition to the standard variety of indoor vegetables and fruits. The key notes about the project have been discussed last July 17, 2011 at Manchester International Festival (MIF). MIF plans an ambitious project to create the Uk’s first multi-storey vertical farm, located in a disused tower block right there in Manchester (http://mif.co.uk/event/vertical-farm). A vertical farm of five stories is also planned for Milwaukee, Wisconsin by Will Allen’s Growing Power organization, in collaboration with the Sweet Water Foundation (aquaponics components).Milwaukee’s vertical farm is in the final stages of fund-raising. Despite the viability of those projects, and the proven results gained, some experts tell that the immediate opportunity for cities may simply be to take advantage of the space available on urban rooftops, and to pursue horizontal urban farming rather than vertical farming. For example, BrightFarms Systems, a commercial offshoot of NYSW, is working with Gotham Greens, another company to emerge from the Science Barge, to create the world’s first commercial urban hydroponic farm in Brooklyn (NY). Gotham Greens’ first greenhouse facility, in Greenpoint,Brooklyn, began harvesting in June 2011. The greenhouse will annually produce over 80 tons of premium quality produce, year-round, that will be available at select retailers, markets and restaurants across the city. In 2012, Gotham Greens plans to expand operations to grow an even more diverse range of premium quality leaf and vine crops. For experts, it is unclear how competitive this rooftop farming will be. It may not be able to compete with other suppliers in a global market unless people are prepared to pay a premium for fresh, local food, but the emotional factor is at stake. As some of the projects developed, for instance, in vacant spaces in Spanish cities, prove, (see, for all, http://gravalosdimonte.com/ experience on huertos urbanos), people’s behaviour is changing when facing the option of eating self-grown (and much expensive) vegetables, agreeing with paying higher rates for living the experience of growing and harvesting their own food, specially in public spaces. A test case about horizontal farming in the city, but using vacant spaces is London’s Capital Growth project. Born as a partnership initiative between London Food Link, the Mayor of London Boris Johnson, and the Big Lottery’s Local Food Fund, aims to create 2012 new community food growing spaces acrossLondonby the end of 2012. By making under-used land available to growers, Capital Growth offers practical help, grants, training and support to groups wanting to establish community food growing projects as well as advice to landowners. Before green skyscrapers will be raised up, rooftop farming and horizontal harvesting at under used-land is much less glamorous than the grand vision of crops being produced in soaring green towers of glass. But, for the time being, this more down-to-earth approach is much more realistic than almost real sci-fi dream of fields in the city skies. self-employed and people who are jobless. More than half in the uninsured are under the age of 35. They do not come to feel they are needing health insurance since they’re young along with healthy. Their own income is usually spent on property, food, as well as entertainment. Many people that do go to work either entire or not professional are not provided insurance by way of their work so they head out without because of the rising cost of health insurance in the states. Thanks for the tips you write about through this blog.